When I look for material to perform these are a few of the qualities I look for. The trick in this video certainly meets these qualities. It is something you must see and experience live and in person to get the full effect. 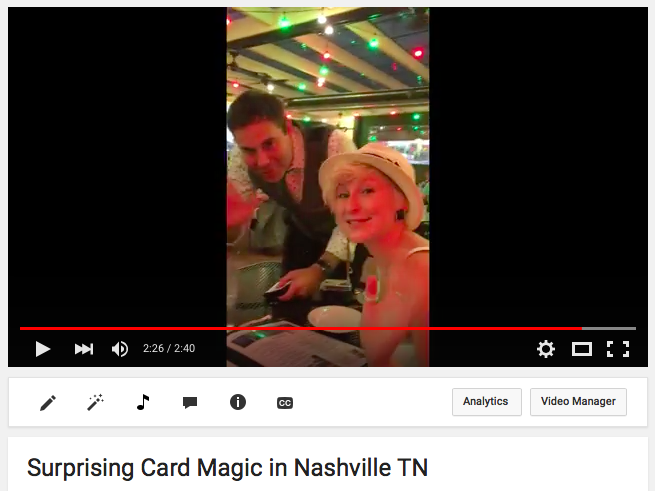 This video was filmed at Coco’s Italian Market where I perform close-up magic on Friday nights. Coco’s Italian Market is owned by Chuck Cinelli who also owns Cafe Coco. It is a fun and unique place with delicious food and I am grateful to be employed there! One thing I tried to do in this video is feature the people I was performing for more. I am going to try and this more in upcoming videos. You get to see everyone who was at this table this time at the end of this video so be sure to watch it to the end! I am really hoping I see you at Coco’s Italian Market on a Friday night very soon. I perform there every Friday night unless I am booked for a private party. Who knows, if you don’t see me perform in Nashville TN, you could see me perform in Goodlettsville TN, Lebanon TN, Chattanooga TN, Franklin TN or maybe even Memphis TN! Copyright © 2019 Nashville Magician Tim Friday. Powered by WordPress. Theme: Spacious by ThemeGrill.